Was founded to provide the very best powder-coating and custom special effect finishes available. Aluminum Powder Coating, LC applies finishes for leading manufacturers of furniture, shutters, railings, marine parts, mail boxes, electrical and air conditioning components, lighting equipment and other products made of aluminum and non-galvanized steel. 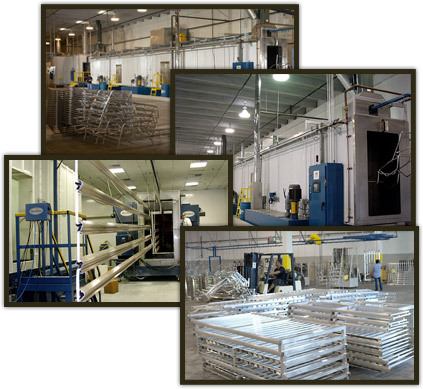 A "State-of-the Art" powder coating system housed in a new 34,000 square foot factory. The system consists of pre-treatment, cleaning, rinsing and non-chrome conversion application with automatic dry-off and inspection stages. An environmentally controlled clean-room, with movable spray booths is used for powder application. Curing is accomplished in a 140-foot straight-line gas fired oven. All stages use the latest computer monitoring controls.